The race to the first $1 trillion market cap is on. The tech behemoths in the stock market led the way in 2017, and investors cheered as they saw their brokerage accounts swell. You see, the tech companies that led the markets high last year were the ones that came on the scene relatively recently with game-changing products and services. Cloud computing is just one of the many technologies they offer that are truly changing the world. And you likely know that, as a group, these tech stocks got whacked in the first quarter of 2018. Aside from normal, corrective pullbacks that were long overdue, this year's mini "tech wreck" exposed, as Warren Buffett says, who was swimming naked. The full quote is "Only when the tide goes out do you discover who's been swimming naked." What it means is that when times are good, investors like most stocks and forgive their transgressions. But when times change, as they certainly did last quarter, we get to see which companies are truly tuned into what's important – and growing. Money Morning Chief Investment Strategist Keith Fitz-Gerald pointed out the split that seems to have overtaken the technology sector's leaders. He said the broader, tech-led rollover would treat tech stocks based on personal trust differently than those based on corporate data, security, and operations. Facebook stock is down about 19% from its February peak thanks to its lack of protection of customer information. Cloud computing and services company Alphabet, for example, is down about 13% from its zenith. Amazon.com Inc. (Nasdaq: AMZN) is also down about 13% from its March peak, but down only 7% from its February peak, when its peers topped out. When investors talk about cloud computing, corporate security, and other operations, they mention Alphabet, Amazon, and Apple. 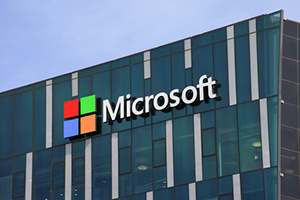 However, the company they should talk about more – a lot more – is Microsoft Corp. (Nasdaq: MSFT). CEO Satya Nadella's emphasis on cloud computing matches markets perfectly at a time when, according to Morgan Stanley, "public cloud adoption is expected to grow from 21% of workloads today to 44% in the next three years" – a figure Fitz-Gerald thinks is 10% too low. Microsoft has several cloud units, including everything serving up the Office 365 product line and Azure hosting. The company also has the popular Xbox hardware and software, as well as LinkedIn. Note that these points are focused on the public cloud market, which will more than double to $250 billion. The private cloud market is estimated to grow at a compound annual growth rate of 31.61% over the next nine years, reaching $237 billion by 2026, according to Statistica. Gartner, a leading consultancy and technology research firm, suggests that the "cloud shift" we're talking about could impact more than $1 trillion in IT spending within the next two years. Combine tax cuts and stock buybacks, and Microsoft stock is poised for some serious upside.